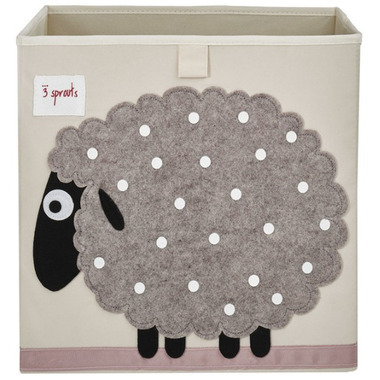 We have a lot of these as they work great for keeping our little ones toys neat and tidy. Cute designs and hold up to tough play. This turned out to be even cuter than I imagined and the size is perfect for use with Ikea storage units. I will order the hdgehog next. Cute! For our needs didn't seem sturdy enough though over the long run. Gorgeous well-made product, nice and sturdy and oh so cute in my baby's nursery! Great product! Super cute, and sturdy. We get many compliments as we have a few of these as accent baskets in our kids toy room/shelf. Very cute design and very sturdy. Helps kids develop organization skills and looks cute in any room. Super cute! Very sturdy with lots of room, bigger than most other cloth storage bins! Love this storage box. Sheep decal so cute. I have it in my front entrance way so the grandchildren can run to see what toys Nana has put in in. Very sturdy, great size and certainly posh enough for a front entrance way. Love these storage boxes. Great size and sturdy. This one felt a little more "girlish" as the stripe along the bottom is pink. But then again I did order it more for myself then my son. I thought it was too cute not to get. I think they will hold up well over time. I have the big chest and caddy from 3 Sprout as well and I think this is a great size for toys that will be used daily. The ones that are not used everyday stays in the big chest. Just watch out when your baby is learning how to stand because the box could be damaged or pulled down to the floor easily as the little one wants to pick the toys out of the box.